FAIRFAX, Va.--(BUSINESS WIRE)--As springtime approaches with the promise of warmer temperatures, it also brings with it the perfect conditions for termite populations to thrive. With harsh winter weather leaving many homes and properties across the country susceptible to these wood-destroying pests, the National Pest Management Association (NPMA) is working to educate consumers and spread awareness about this destructive species during Termite Awareness Week, March 10-16. Termites, known as “silent destroyers” for their ability to chew through wood, flooring and even wallpaper undetected, cause more than $5 billion in property damage in the U.S. every year – damage that is often not covered by homeowner’s insurance. Homes with moisture damage from rain, snow and ice are prime targets for termites in search of structures in which to establish new colonies. For a behind-the-walls look at just how destructive these pests can be if left unchecked, NPMA released footage of its Tiny Termite House, a groundbreaking experiment and video production. The group constructed a tiny, built-to-scale dream home, and then introduced more than half a million Formosan termites to document the damage in a never before seen point of view. The house was a total loss despite looking structurally sound from the outside. SWARMERS: Swarmers are young female and winged termites that often invade homes in the springtime. They especially seek out buildings that have sustained damage from severe winter weather. 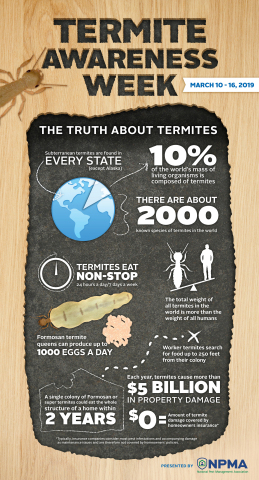 Once swarmers have determined your home to be a good fit, it’s likely that the rest of the termite colony will follow. DISCARDED WINGS: The discarded wings of swarmers can often be found near windowsills and doors and are often the first and only outwardly visible sign of a termite problem. WOOD DAMAGE: Termites tend to eat wood from the inside out, so wood that sounds hollow when tapped often signifies a termite infestation. Homeowners should also look for rotting wood and cracked or bubbling paint, as these are signs of moisture buildup that could either mean water damage or termites. FRASS: Drywood termites produce wood-colored droppings as they eat through infested wood. If a homeowner finds a small pile of what looks like pellets inside or outside the home, it could be a sign of drywood termite infestation. MUD TUBES: Subterranean termites, the most destructive termite species, build mud tubes to provide moisture while they travel between their colony and a food source. Mud tubes are most often found near the home’s foundation. For more information on how to prevent an infestation and to find a qualified pest control professional, visit PestWorld.org.